Cut your baguette at a slight angle (to allow for more spreading surface). Preheat oven to 400 degrees F. Mix avocado, 3/4 cup feta (the rest of the feta will be used to sprinkle on top), lemon juice, 2 Tablespoons salt, 2 Tablespoons garlic salt and 3/4 cup olive oil. Blend well in food processor. Place 1 Tablespoon of avocado mixture onto each sliced baguette piece, spread to cover the whole slice. 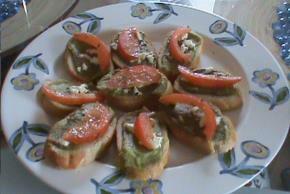 Take the remaining feta 1/4 cup and sprinkle it on top of spread placed on baguette. Place in oven for approx. 10 minutes. While baguettes are crisping, slice tomatoes in long slices and take the seeds out. Pour 1/4 cup olive oil, 1 Tablespoon salt, 1 Tablespoon garlic salt and parsley over the tomatoes you have sliced. Coat the tomatoes evenly. Take the baguettes out of the oven and place a slice of tomatoes on each baguette and serve.